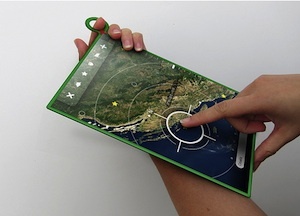 Top: OLPC mockup of the XO-3 tablet, which is scheduled to be released in 2012. Bottom: Marvell's Moby reference design, the basis for the OLPC tablet scheduled for 2011. Nearly 2 million children worldwide already use the renowned XO laptop computer, according to its provider, the philanthropic organization One Laptop Per Child (OLPC). And now, with the help of no small amount of feedback from its users, OLPC has teamed up with integrated technology solutions developer Marvell to design the next generation of durable, low-cost computers for students in global regions underserved by technology: The sub-$100 XO tablet. Like its predecessor, the XO tablet will feature a rugged outer casing for safe use and transport in rural, mountainous, desert, and other remote areas challenged by extremes in physical geography and climate. However, the new model will also feature several upgrades resulting from the feedback OLPC has received. The tablet will use less energy (1 watt, as compared to 5 watts for the XO laptop), and it will feature a multilingual soft keyboard with touch feedback, which will offer easy access to native speakers of virtually any language in the world. According to a blog post today, "Some of [the tablets] will be OLPC machines targeted for the developing world, such as the XO-3 [pictured above]. The line will be based both on Marvell’s reference design for its Moby tablet and on OLPC’s XO-3 designs (particularly for the low-power end of this line). The machines distributed by OLPC will run our standard Linux image, with Sugar & Gnome environments." The blog post went on to say that the first machines are expected to be available next year and will be displayed at International CES in January 2011. 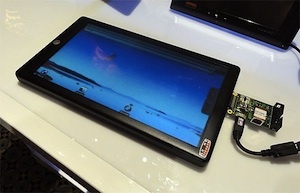 The XO-3 tablet, also pictured above, is still expected to ship in 2012. "Today's learning environments require robust platforms for computation, content creation and experimentation--and all that at a very low cost," said Nicholas Negroponte, founder and chairman of OLPC. "Through our partnership with Marvell, OLPC will continue our focus on designing computers that enable children in the developing world to learn through collaboration, as well as providing connectivity to the world's body of knowledge." To date, most XO machines have been donated to students in third world countries through the fundraising efforts of the OLPC Foundation, a project Negroponte plans to continue and expand with the new tablet model. Information on the group and its work, as well as on how to donate and become involved in local and regional OLPC efforts, can be found here.